Broughton is a small market town with a long history and a fascinating collection of buildings., many of industrial interest. The walk starts from the Donkey Rock quarry (SD 210868) on the edge of Broughton along the Foxfield Road. 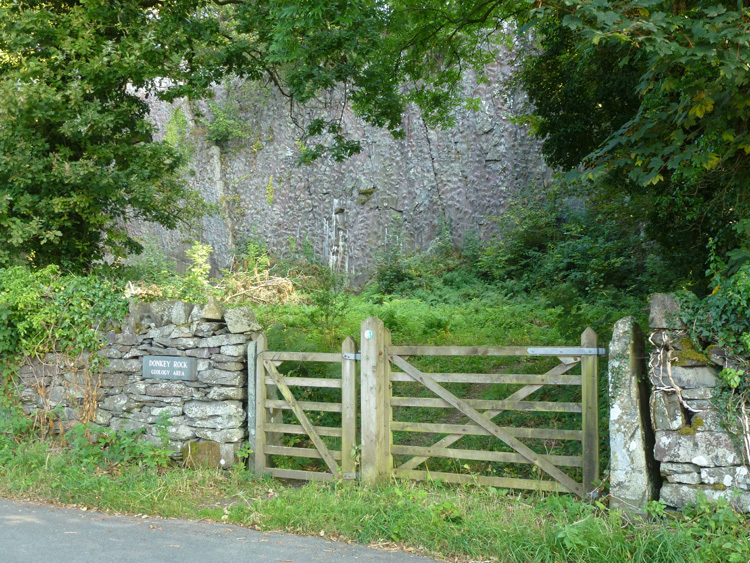 The Donkey Rock or Eccleriggs Quarry is an important geological site. The bumps you can see on the quarry face are the undersides of hollows scoured in the ocean floor 425 million years ago. These have been tilted vertically by later earth movements, and exposed by quarrying. 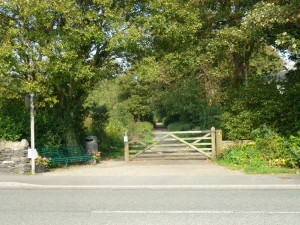 Head along the Foxfield Road away from Broughton for 50m and take the footpath to the left just before Saddler’s Barn. As the footpath turns to follow the wall over the brow of the ridge look left towards the highest point and the woodland behind the field wall. You may just be able to make out the stump of the tower which was Eccleriggs Windmill. It is described as “small and early looking”, with two or more likely one pair of stones to grind oats. It appears on Yates’ map of 1786 and was still in use in the 1840s, but disused by 1890. 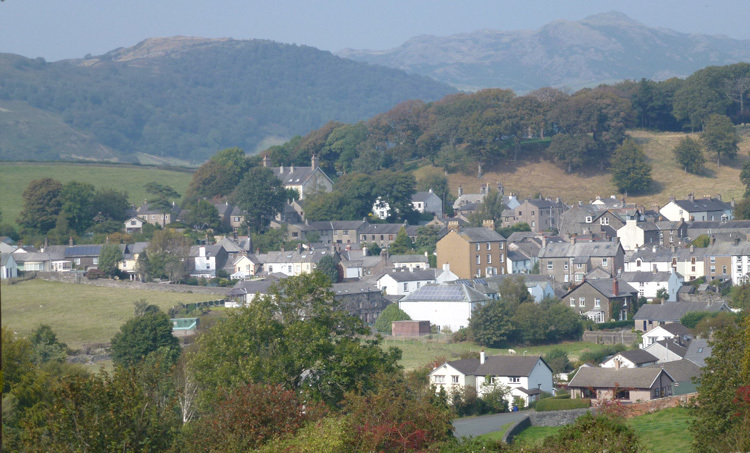 The sites of 72 windmills have been identified in Cumbria. 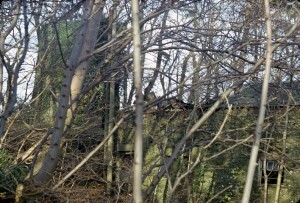 Continue along the footpath, bearing left after The Miller’s Cottage, and follow the track along the ridge to reach the main road into Broughton at the Lodge. 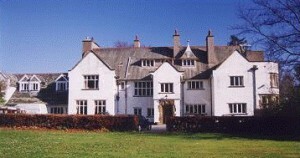 Across the road is the entrance to the primary school, and behind that stands Kepplewray house. 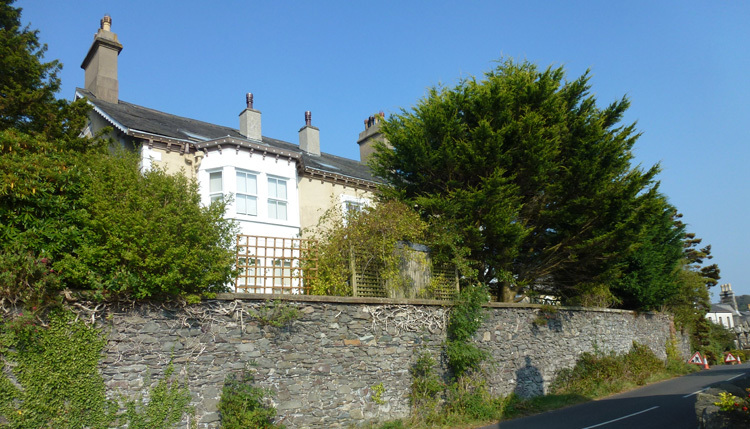 This was built on land purchased in 1899 for William Isaac Barratt, in a convenient location for the family businesses – the copper mines at Coniston and the iron ore mines at Hodbarrow. 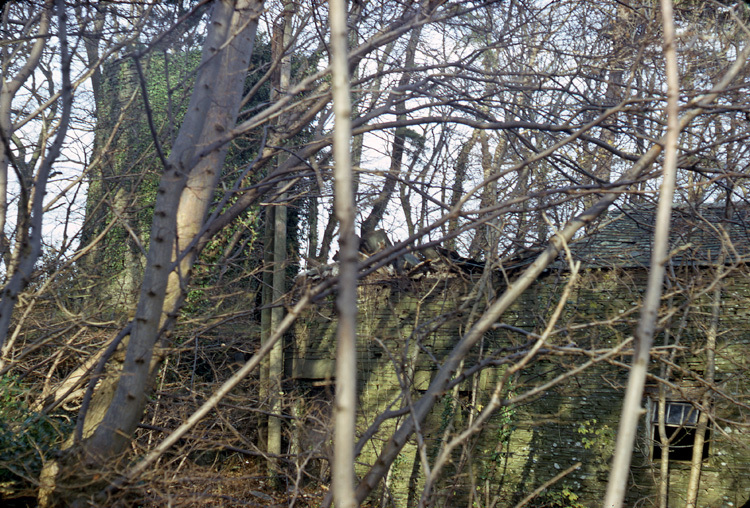 Walk down the hill, noting the jumble of buildings on your left, and take the first left into Foxfield Road. 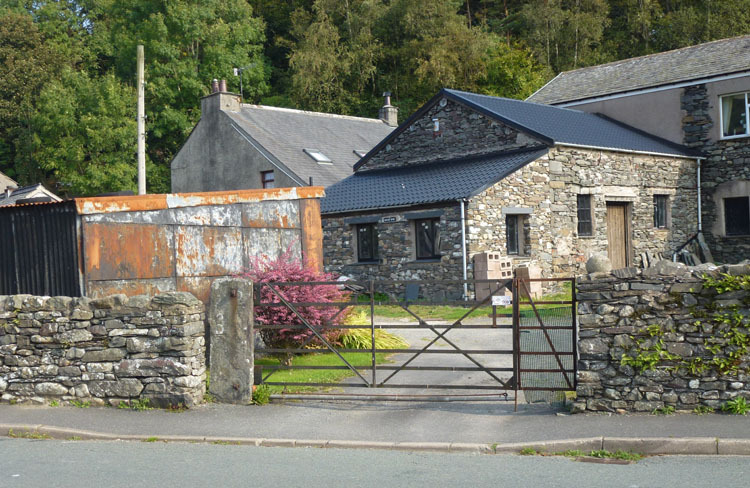 During the 19th and into the 20th century, Broughton developed as a centre for oak swill basket making and other wood products. 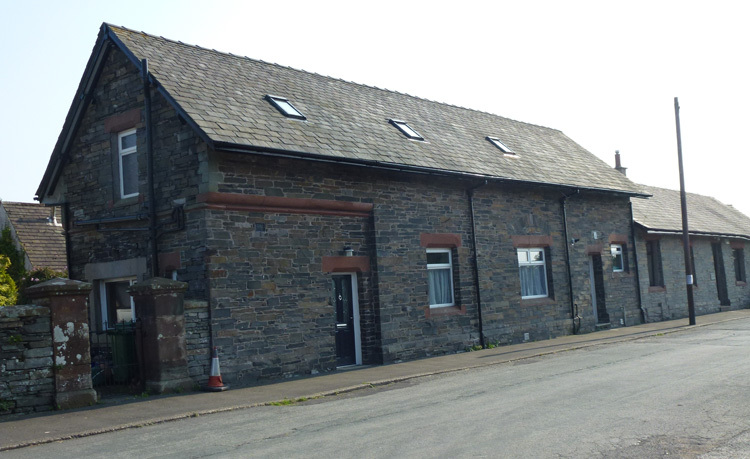 The largest workshop was here at High Kepplewray, but there were others in and around the town, employing 25 men in all by 1890, producing thousands of baskets for use on the farm, in the mines and elsewhere, including the loading and unloading of ships. Return to the top of Foxfield Road and turn left. 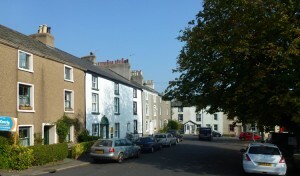 Notice the original route of the road into town, in front of the cottages on your left and across to Princes Street. The road was moved a little to the north when the Coniston Railway was built, with a signal box on the corner next to it, and a level crossing across the track. 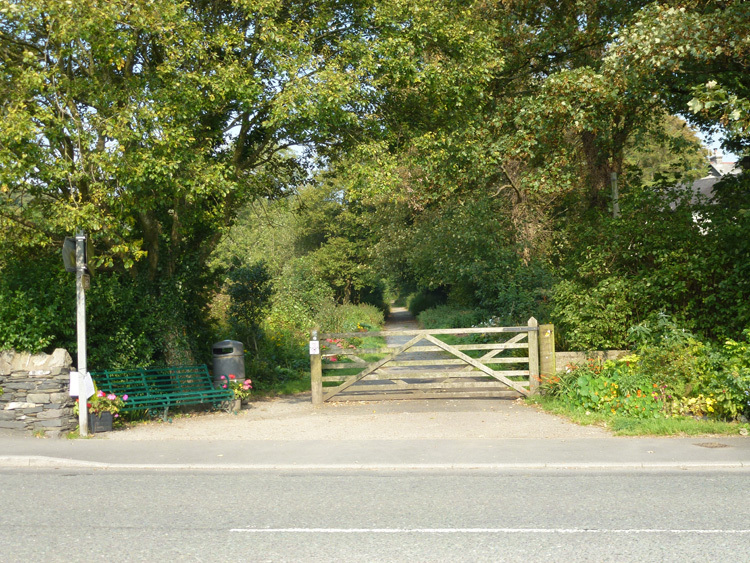 Cross over the road and walk up the line – now a footpath and cycleway. 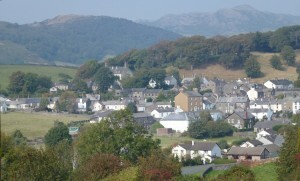 The Coniston Railway was opened in June 1858 with the intention of capturing the transport of copper ore and slate from the Coniston mines and quarries. By 1900, however, these had closed and the line was reliant on tourist traffic until its closure in 1958. After about 800m along the track, in the cutting, you will pass a drain cover. 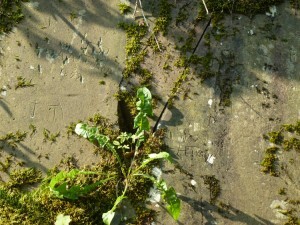 Not long after that, before you reach a large tree, you can make out carvings on a smooth rock face on the left. 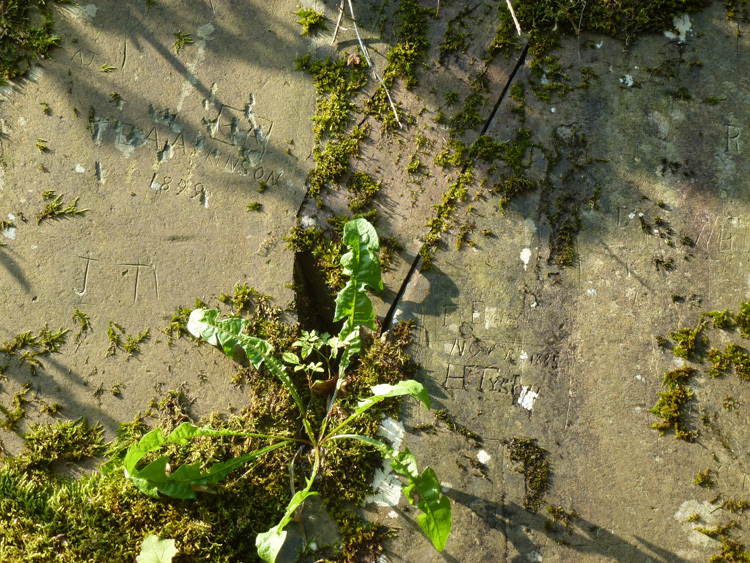 Here – as a piece of original railway graffiti – you can still make out the names Tyson and Atkinson, and the dates 1885 and 1899, among others. The carvers must have chosen their times carefully to avoid the passing trains! As you pass out of the cutting take the footpath into the field on your left. Cross the field diagonally left to a kissing gate by the garden wall of Broughton Tower. Carry on between the playground and football field, exit to the lane which leads to The Square. Just before you reach The Square turn left down Timber Street (with another wood workshop) and right at the bottom to reach Market Street by the petrol station. 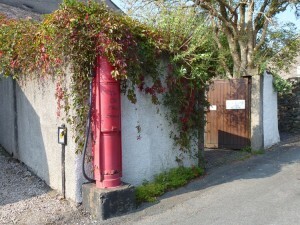 This fine example of an old petrol pump is on a right hand wall corner half way between Timber Street and Market Street. Turn left and then right and straight ahead into Station Road. 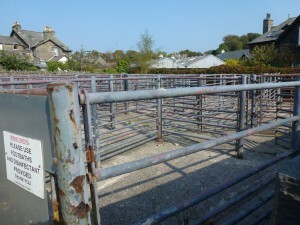 On your right are the cattle pens for the once thriving market. On the left is the station building with the station master’s house to the left. 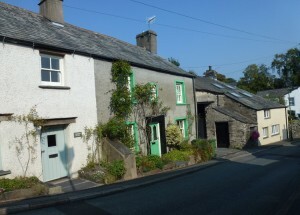 These were built to the north of the original terminus of the Furness Railway when the line was extended through to Coniston. With your back to the station walk up Station Road to the junction and turn left up Church Street. 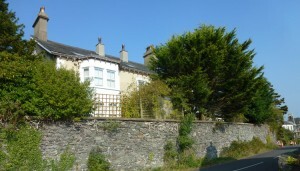 Just before the old school take the footpath left towards the church. As you approach the church look right across the field. The building on the left hand side was built in 1910 on the site of Broughton’s earliest known tannery , which was in existence by 1750. A second tannery was established just upstream in 1780 by William Tyson, a skinner of Grasmere, who built Low Syke House – “a dwelling house with vats for the working of leather”. The stream that fed them both is now culverted and out of sight. Leave the churchyard by the gate below the church, cross the marshy field and turn right along the footpath and lane by the two tanneries to reach Church Street again. 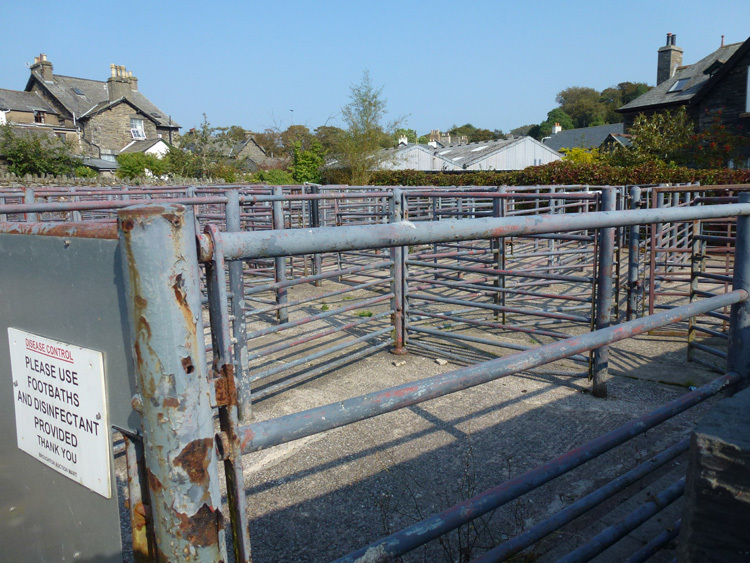 Here was the oldest part of Broughton, and included another basket workshop and tannery. A slate lined pit with a water inlet and drain was found here when rebuilding took place on the site. Turn right down Church Street, bend left into Griffin Street to arrive at The Square, with the entrance to Broughton Tower straight ahead. 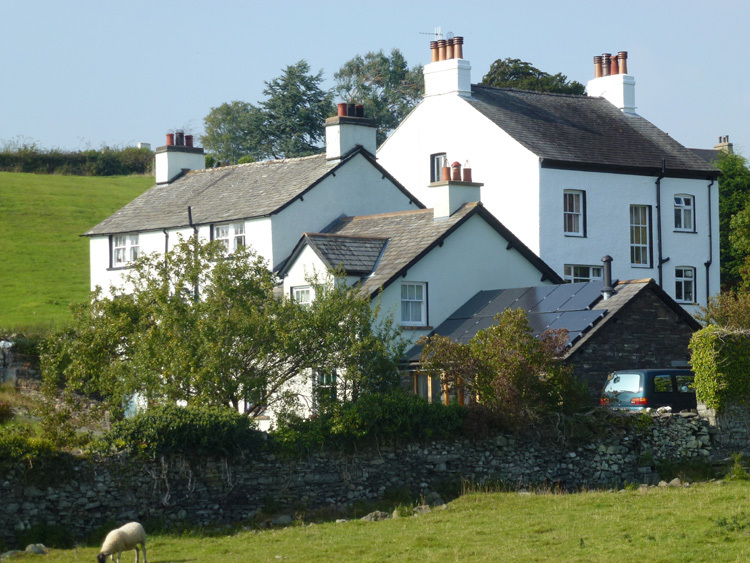 The Square was built in the 1760s by the then Lord of the Manor, Sir John Gilpin Sawrey, inspired by the impressive new squares he had seen in London. 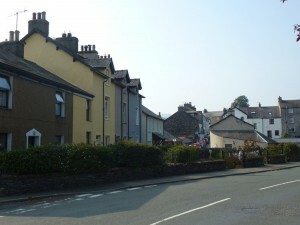 Note New Street leaving The Square on the left. 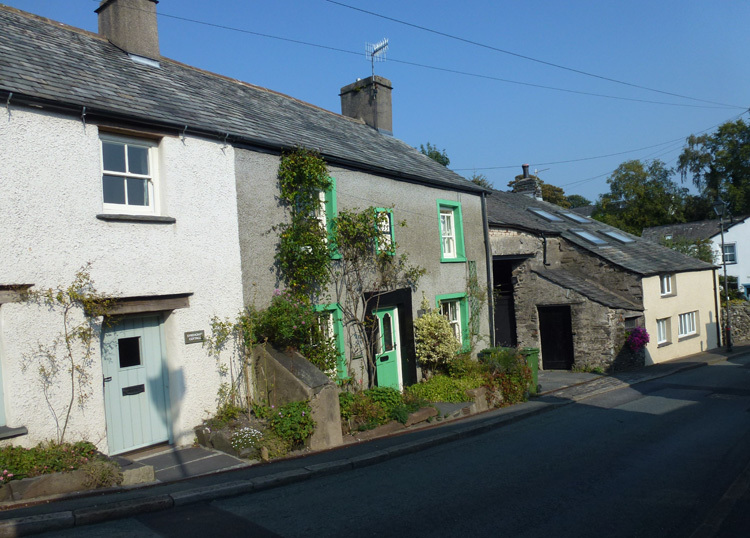 This was built in the 1790s as a short cut to the Coniston road from High Cross. It goes straight to the edge of town before curving round the Tower’s parkland. The last house on the right is Broom Hill, bought and modernised in 1860 by Nathaniel Caine – one of the original investors in the Hodbarrow mines. Leave The Square by Market Street, down past the petrol station, across the site of the level crossing and turn right into Foxfield Road. Follow it back to the start. All the photographs were taken by the author in September 2014, except the one of Eccleriggs Windmill which is taken from the Mike Davies-Shiel Collection (300-207) and dated 1973.